My friend Katherine just yelled at me. She said, "You haven't blogged anything since Ducklings" as she sat beside me on the couch. So I said, "Fine, I'll blog something." 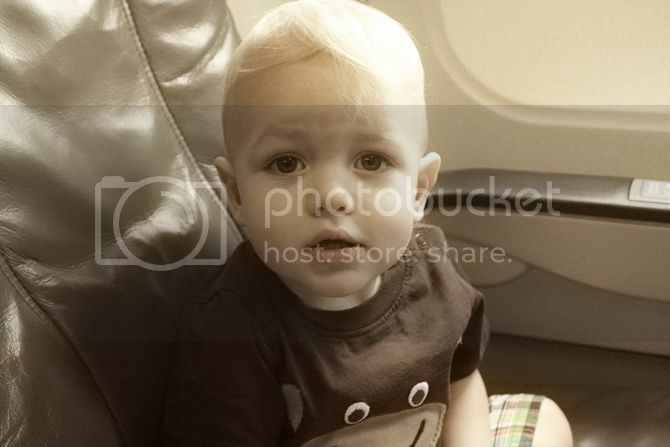 This is Finley on the airplane to Boston. Is that good enough? Because it is 2:30 AM and I am tired. But--good news--Kat's camera is magic and Finley takes DARLING pictures with it. So, stay tuned, readers. There are sweet baby pictures on the way. i havent been to your blog-a-roo in a while. cute stuff. and i love kristin's design you did. props to you! Did you take this picture with your DROID? he is quite cute....what a well traveled little dude. next time i get on a plane i want to sit next to this adorable guy. for once i wouldn't mind sharing an arm rest with someone. and what's this? i go away for a few months and Finley has aged something like 7 years. it must be true what they say, they do grow up fast.